There are 8 Assisted Living Facilities in the Plainfield area, with 3 in Plainfield and 5 nearby. The average cost of assisted living in Plainfield is $4,332 per month. This is higher than the national median of $3,346. Cheaper nearby regions include Joliet with an average starting cost of $3,380. To help you with your search, browse the 99 reviews below for assisted living facilities in Plainfield. On average, consumers rate assisted living in Plainfield 4.1 out of 5 stars. Better rated regions include Lemont with an average rating of 5.0 out of 5 stars. Caring.com has helped thousands of families find high-quality senior care. To speak with one of our Family Advisors about assisted living options and costs in Plainfield, call (855) 863-8283. Plainfield, population 42,527, is located in Will County in the northeastern part of Illinois. It is only about an hour's drive from Chicago, making it ideal for seniors who enjoy trips to the city but prefer to live in a smaller community. In Plainfield, assisted living establishments must provide their residents with single-occupancy apartments with private bathrooms and space for small kitchen appliances. There are 38 assisted living facilities near Plainfield, all regulated by the Illinois Department of Public Health, Division of Healthcare Regulation. The harsh climate in Plainfield is an important factor for seniors considering living here. The city gets an average of 29 inches of snow each year and has a January low temperature of 15. While this is perfect for those who love the cold, seniors who prefer warmer climates may have a hard time adapting. The sales tax rate in Plainfield is 2.5 percent higher than the national average. At 3.8 percent, the income tax rate is lower than the U.S. average. However, in Illinois, almost all retirement income is exempt from taxation, including Social Security retirement income and income from retirement savings accounts. Seniors should feel fairly safe in Plainfield. With a violent crime rate of 18.4, Plainfield scored lower than the Chicago metro area and the state and national averages. The property crime rate in Plainfield is 19.3, which is also lower than that of the Chicago metro area, the state of Illinois and the United States. Plainfield has a high cost of living index. With a score of 105.6, the city has a higher cost of living than the state of Illinois and the nation, with housing being the biggest factor. On a scale of 1, being the worst, to 100, the air quality in Plainfield is 72. This is considerably higher than the national average, which is good news for seniors who suffer from respiratory illnesses such as asthma and COPD. The Plainfield area is home to world-class medical facilities, including Edward Outpatient Center-Plainfield and Presence Health, in the event of medical emergencies or illness. Assisted Living costs in Plainfield start around $4,332 per month on average, while the nationwide average cost of assisted living is $4,000 per month, according to the latest figures from Genworth’s Cost of Care Survey. It’s important to note that assisted living rates in Plainfield and the surrounding suburbs can vary widely based on factors such as location, the level of care needed, apartment size and the types of amenities offered at each community. 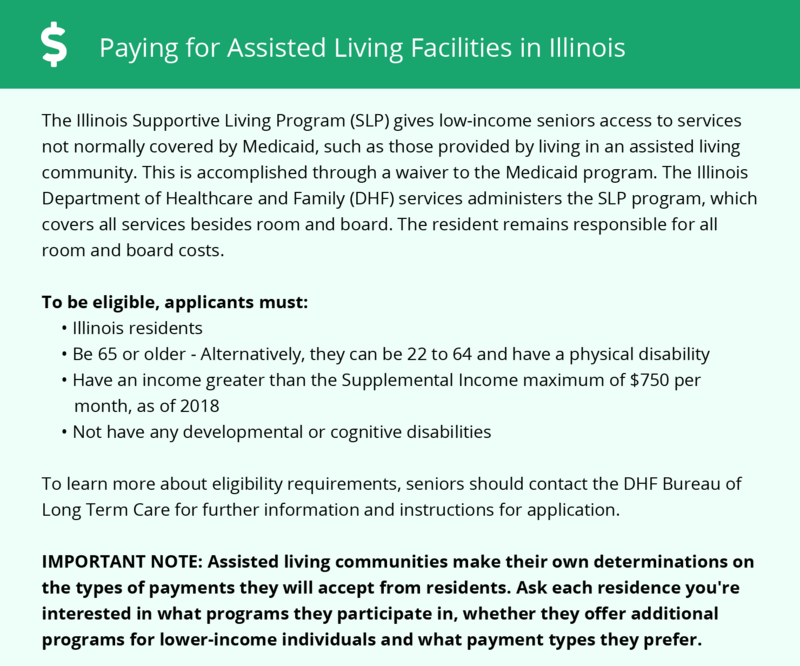 In the state of Illinois, Medicaid does not pay for services provided by assisted living establishments. However, there are two waiver programs that offer financial assistance. The Medicaid 1915(b) Waiver Program, also called the Supported Living Program, and the 1915(c) Waiver Program, called the Managed Long-Term Services and Supports Program, provide help with the costs of assisted living services for residents who qualify. Learn more about these programs, plus who’s eligible, on our Assisted Living in Illinois page. For more information about different ways to finance assisted living, visit our Assisted Living in Illinois page. Plainfield and the surrounding area are home to numerous government agencies and non-profit organizations offering help for seniors searching for or currently residing in an assisted living community. These organizations can also provide assistance in a number of other eldercare services such as geriatric care management, elder law advice, estate planning, finding home care and health and wellness programs. To see a list of free assisted living resources in Plainfield, please visit our Assisted Living in Illinois page. Plainfield-area assisted living communities must adhere to the comprehensive set of state laws and regulations that all assisted living communities in Illinois are required to follow. Visit our Assisted Living in Illinois page for more information about these laws.